Here. Forward. : Happy Golden Birthday! Emmitt turned 14 on the 14th! She is still a spunky old girl. 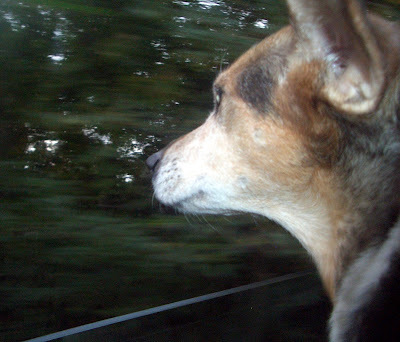 We took her out for an evening drive through the country and let her put her face out the window and enjoy the breeze. Sadly, we haven't done this in a very long time. We, as a family, have become so busy lately and oftentimes we leave her behind, tucked away in the laundry room during the day while we go out and enjoy ourselves. We came upon some cows crossing the road and were forced to slow down and let her bark at them. The farmer in his pickup truck wasn't too thrilled with this but we didn't care, it was our dog's birthday! We also came upon several deer and we slowed down to watch them perk up their ears and stare us down. She loved every minute of it. Hmmm, what will we do next year? Aww, happy birthday Emmitt. What would we do without them? I celebrate my dogs birthday with car rides and big bones! What a lovely gift for the doggie! It sounds like it was a fun time. Did she get treats afterward?